Aitor was our guide for San Sebastian and I cannot recommend him highly enough. We were traveling as a family of seven from America. From the moment we met him, he told us the history of the region, the significance of the food and wine and why he is so proud to be Basque. He took us to the city center of San Sebastian where we wandered the streets pointing out unique structures. Aitor also helped us to sample some of his favorite Pintxos bars that were truly amazing. You can't go wrong with Aitor! Aitor was a fun, knowledgeable, and awesomely attentive guide for my trip to San Sebastián and Bilbao. From helping to make recommendations before I arrived, to picking the perfect spots for me to add that I never would have known about, I am very grateful for the ways he made my visit out of this world good! We had a great time with Aitor. He did a fabulous job for us. We were a group of 4 adults with several days in Bilbao. I told Aitor we wanted to visit San Sebastián for a day and he took care of the rest. He met us at the hotel. He had a nice van with plenty of room for all of us. He put a nice day tour together with several stops along the coast. We arrived in San Sebastián in time to tour the old town and sample some of the best pintxos in town. I would book Aitor again in a heart beat. TOUR GUIDE RESPONSE: Thank you very much! I love that area because it mixes best of the ocean, the mountains and the food. So glad that I could share it with you! Aitor was a FANTASTIC guide ... his knowledge is exhaustive, and his enthusiasm is contagious. He "read" us well (not souvenir shoppers, pretty fast walkers) and adjusted the pace accordingly. His service was comprehensive and courteous. Truly a wonderful experience. Touring with Aitor has been the highlight of our honeymoon. He is not only very knowledgeable about the history and sights but he also knows all the great food spots along the way. We toured from Biarritz down the coast back to San Sebastian. Aitor customized our tour on the fly based on our interests so each tour is unique. Traveling with Aitor is like having a great local friend who knows all the good spots. I would highly recommend Aitor if you want to take a tour anywhere in northeastern Spain. Aitor was amazing, I would give him 10 stars if I could. He was friendly, knowledgeable, on time and his English was great. I would definitely recommend any tour with Aitor. He taught us so much, brought us to great places, and had great recommendations for after. Aitor was one of the best local tour guides we have ever had! TOUR GUIDE RESPONSE: Hi, Thank you so much indeed, I really loved meeting you two too and so happy to know that you enjoyed my advises as well. Hope that we can meet back to show you more things in our region. Aitor D.
This was our third tour with Aitor and by this time he is like family. We went to visit two prehistoric caves with cave paintings, the oldest is dated at 40,000 years ago. After a wonderful lunch at a local tavern, we visited the museum associated with the "mother" of all prehistoric caves. Finally we visited a medieval village and enjoyed a glass of local milk and pastries and a walk through the streets. Aitor has an amazing breath of knowledge about everything he showed us on our three tours. Aitor is simply the best guide we have ever had, anywhere. Our trip to Spain would not have been the same without him. He knows the best hidden spots to eat amazing foods. Aitor went out of his way to take us to a village festival on this tour, which was a nice surprise. FIVE STAR RECOMMENDATION!!! TOUR GUIDE RESPONSE: Thank you so much indeed for selecting my services again in this second trip to Spain. It has been a true pleasure and hope that your son come back with you next time! Aitor is simply the best guide we have ever had, anywhere. Our trip to Spain would not have been the same without him. We are Game of Thrones fans and he took us to a possible future scene location. He knows the best hidden spots to eat amazing foods. FIVE STAR RECOMMENDATION!!! TOUR GUIDE RESPONSE: Thank you so much indeed! I was really honoured to meet you back in this second trip to Spain. There are so many interesting places here! We had a great day with Aitor! So much fun spending the day in Basque Country with him. He is very knowledgeable and made us feel like we were seeing the city with a friend! We would highly recommend Aitor! TOUR GUIDE RESPONSE: Thank you so much Dayna! I really felt the same. Hope that we can meet back soon! So many things to see! Our guide, Aitor D, was just perfect! We use Tours by Locals for many years, and we were always satisfied, but Aitor is one of the best guides we have ever had. He is knowledgable, friendly, helpful in all possible ways, he has a great personality, and he is just fun to be around. We will recommend Aitor to our daughter and to all people interested in a really good tour guide. TOUR GUIDE RESPONSE: Thank you so much for your review! I enjoyed so much with you! Looking forward to meeting your daughter! We rate Aitor as a 5 out of 5. He was prompt, delivered as promised and more, flexible, knowledgeable, and fun to be with. We would gladly book a tour with him in the future. TOUR GUIDE RESPONSE: Thank you so much indeed! I was very proud to show you this surprising area. Hope that next time we can meet to see other different regions closeby. Regards, Aitor D.
This tour to St Sebastian is reviewed with Aitor's other tour -- he privatized the tour just for us, so we went to St Sebastian, and did not spend time together in Bilbao as we had planned. TOUR GUIDE RESPONSE: thanks. I am happy to tailor my services according to your interests, and I am very happy that you loved the change your idea to see San Sebastian together. Love that you liked it! Hope that next time we will have time to see Bilbao and other parts of the Basque Country! Altor perfectly anticipated our needs for a tour that would let us see as much as possible without taxing my 91 year old mother's stamina. He was very knowledgeable about the area and enthusiastic about showing it to us. And the pintxo bars are not to be missed! Altor had me trying and liking dishes I would never have tried on my own. This tour is a wonderful mixture of scenery and food! TOUR GUIDE RESPONSE: Thanks! I loved to meet your mother and enjoyed so much meeting you! Hope that we can meet again so that I can take you to small villages to see the producers of some of our delicacies! TOUR GUIDE RESPONSE: thank you so much Richard. Hope that next time we will have more time as there are many things to see. I will always remember your face when you saw the surname of our new president, Mr Rementeria! This is the best tour ever. The guide took us to sights that were unexpected, and stayed with us for extra hours to cover additional sights. He is most highly recommended. TOUR GUIDE RESPONSE: thank you so much Richard. Hope that next time we will have more time as there are many things to see. The French Basque Country is like part of us, but also has his characteristics, and I have loved to share it with you. Thanks. We really enjoyed our tour in Cantabria with Aitor. The cave visits were very interesting, without the information being overwhelming. Santillana del Mar was amazing. He was very knowledgeable and patiently answered all of questions about the Basque Country and Spain. Aitor was very flexible with the schedule. He even had our son interested in history for a while, which is next to impossible. Even the restaurant Aitor picked was great. We strongly recommend Aitor as a guide. - Chris and Kari Lynn Q. TOUR GUIDE RESPONSE: thank you Chris & Kari Lynn, for me was a big pleasure to meet you. I am very glad as well that your son had fun as well. Maybe with this impulse and his father's he starts to love history. Aitor D.
My wife and I just returned from our trip to Spain. One of the highlights of our trip was a visit to the beautiful Ason Valley in Cantabria with our guide Aitor. Aitor's knowledge of the area and his easy going personality made for a wonderful tour. We enjoyed visiting some of the prehistoric caves in the area as well as some small villages. We also enjoyed a delicious traditional meal in one of the villages. I higly recommend Aitor and would use his services again. TOUR GUIDE RESPONSE: Thank you so much for your review Michael! I was proud to show you best of this hidden valley of our ancestors and to show you the hidden village of Arredondo also called "Center of the world". Hope to see you back soon. Kind regards, Aitor D.
When it rains, it pours. In Bilbao, Spain, for our second tour with superguide Aitor, we were scheduled to visit the Forest of Oma. However, days of rain made the path too difficult. Without hesitation, Aitor swiftly came up with Plan B. This plan had us hiking down a scenic, windswept cliff to the seashore, before climbing up a long series of steps to a remote church. Some of the most stunning scenery ever. Aitor is amazing. Friendly, open and full of fun facts and anecdotes, he gave great guide. TOUR GUIDE RESPONSE: Thanks Richard, I want to be very professional and this includes having alternatives to make the experience most enjoyable for you. I am very happy to be very flexible at all times of my tours and I really appreciate to see that you enjoyed it as I did the time we share together. Thanks again. Aitor D.
Despite an unscheduled overnight move of our ship from Saint Jean de Luz to a commercial dock in Bayonne, Aitor was able to meet us on time and our day in San Sebastian went as scheduled. We also had a wine tour and tasting of the local wine. Aitor guided us with a sampling of the local pintxos (tapas). A second long, but great day with Aitor. TOUR GUIDE RESPONSE: Thanks for your comment. I really enjoyed showing those hidden gems to you. The moment when the locals asked you about how did you get to that hard to find winery was funny! Aitor met us when our tender docked in Saint Jean de Luz and provided a great tour of Bayonne and Biarritz. He was able to provide a lot of local history and information, both as we drove and walked through the cities. He did a great job of selecting the notable things to see in both cities; and we got to sample the great chocolate in Bayonne. While we had no problems walking, Aitor was very attentive to retrieving the car to save us steps. We was very willing to give his time and not watch the clock. TOUR GUIDE RESPONSE: Thanks Norman, A lot of people see just Biarritz, but Bayonne is a bit unknown and it is really a nice city with many things to offer. And I was very glad that I could show them to you. Fabulous is the only word to describe the day. Aitor is a guide like no other. TOUR GUIDE RESPONSE: Thank you so much Maria. I really appreciate your words, Hope to see you soon! TOUR GUIDE RESPONSE: Thank you so much Laurel! I really love to tailor my tours to whatever it is more interesting and enjoyable for my guests, and I am really glad that you noticed it. TOUR GUIDE RESPONSE: Thank you so much Laurel! I really love this job as it allows me to transmit my love to this small corner of the world. I am so happy that we could share this. The van as more than adequate for us. TOUR GUIDE RESPONSE: thanks, I will let him know! We had a fabulous day and tour with Aitor! His winery and food selections were great, his driving was superb and his knowledge of the area was unbeatable! We were able to be flexible making an itinerary change when we realized that going to San Sebastion wasn't going to be feasible. Instead he took us all through Bilbao and left nothing unseen. We had such a great day that we'd like to return to the area, stay there and hire Aitor for the entire time! TOUR GUIDE RESPONSE: Thank you Susan for your review. It was a real pleasure to show you the best highlights of Rioja and Bilbao. My tours are cautiously designed but I am always happy to tailor them, even on our way, if you want to stop longer in any of the surprising points I show you in my tours. And very happy to see that you loved them. Hope to meet you and your friends soon! Regards, Aitor D.
We were initially hesitant to sign up for this tour because we just found it online but the process was so easy to sign up and receive confirmation. When we met our guide Aitor, he was on time, courteous, and so knowledgeable, our whole family had a great time and learned a great deal! He even went above and beyond, and toured us to places we hadn't planned on but was absolutely worth it. We would recommend Tours By Locals to anyone and especially our guide Aitor D. Thank you for a memorable tour. TOUR GUIDE RESPONSE: Really happy that you enjoyed the tour with me. Thanks for acknowledging one of the values of our work, which is the fast answer to clients and the adaptability to the knowledge and time of our clients. Aitor is such a nice person and a great tour guide! Our friends and I enjoyed our tour and his company! TOUR GUIDE RESPONSE: Thank you very much for your review. I really love to meet people like you and your friends. All the best. We came to the Basque country and had originally planned to visit Vittoria. 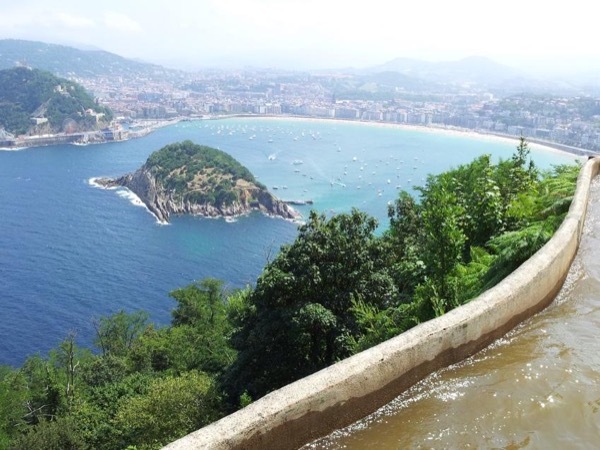 The day of our arrival in Bilbao we were told that San Sebastian is far more beautiful than Vittoria and we called Aitor to ask him to change our trip. He did so without any issues. Aitor knew his material, was charming and friendly. We learned a great deal from him and enjoyed the day that he spent with us. Highly recommended! TOUR GUIDE RESPONSE: Thanks. I really love to adjust my tours to your desires so that you will enjoy best our Country. Hope that next visit you have more time and I can show you also Vitoria and its very well preserved medieval city center. I really had a great time with you and your friends and I am glad that you also enjoyed it! Hope to see you soon! Aitor was perfect guide. He made my husband and I feel relaxed and did his best to cater to our requests. Actually he excelled and went out of his way to show us places he thought may be of interest to us. He was enthusiastic and knowledgeable and we finished off the day feeling a little wiser about the Basque countryside and culture. We thoroughly enjoyed the day and have some lovely memories. Thanks Aitor. TOUR GUIDE RESPONSE: Patricia, thans to you. My interest is to make the experience on my tours the most enjoyable for my guests and I happy to adapt fast to all the interests of my guests. It was really a pleasure for me to meet you and I hope that we have the chance to meet back. All the best for you both. TOUR GUIDE RESPONSE: Thank you. The efforts I make on preparation, study and enjoy of the cities and towns of the Basque Country are wonderfully rewarded when I achieve that my guests enjoy the Basque Country as much as I do.